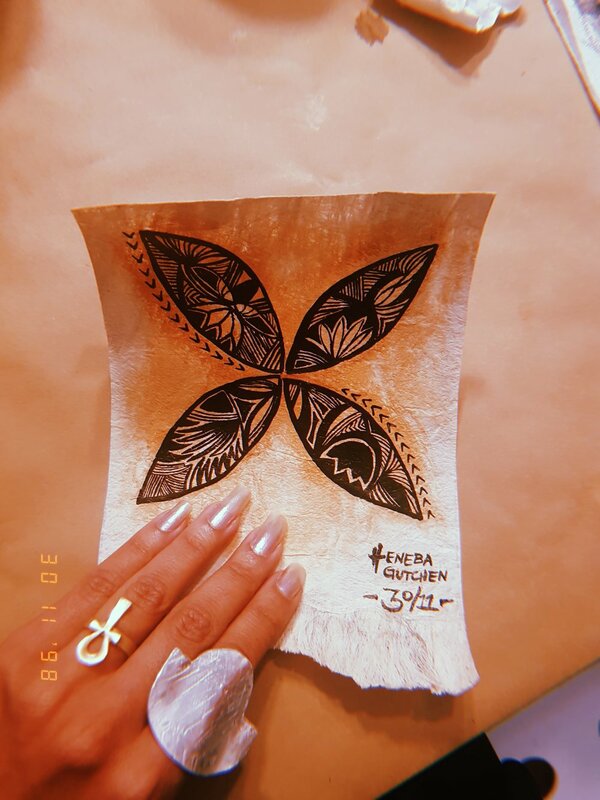 In*ter*is*land Collective spent time with Tui Emma Gillies and Sulieti Fieme’a Burrows while they were in London for Oceania at the Royal Academy of Arts, en route to Madrid where they would further their research within the Tongan collection at the Museo de America. Based in Aotearoa, New Zealand Tui and Sulieti are the 2018 recipients of the Pacific Heritage Art Award from Creative New Zealand for a project to decorate two large NGATU (barkcloth) with women in Sulieti’s home village in Vava’u. Tui and Fieme’a arrived with gifts of NGATU (Tongan barkcloth) from Nuku’alofa and clay from Nuku Island, handmade KUPESI (print block), a bag full of paint brushes, Indian ink and arrowroots paste. After the preparation of materials and work surfaces, we started the day with viewing Tui’s first handmade film of the project in Vava’u ‘Falavai Flava’, followed by much laughter and sharing during an inspirational and productive workshop.